Mumbai: Suraj Lavle—a 25-year-old pharmacy student—bought a Jupiter automatic scooter from TVS Motor Co. earlier this year for use by his mother as well his grandfather. Based in Tasgaon, a village in Maharashtra’s Satara district, the 110cc Jupiter is the first scooter for the Lavle family. They already own a Mahindra Bolero sport-utility vehicle, a Swaraj tractor, and two motorcycles—a Royal Enfield Bullet and a TVS Star City. Lavle purchased the scooter since his mother and grandfather need to commute more frequently to the school and hospital respectively. “This scooter will be used by everyone in the family, even my younger brother. We could not do that with the motorcycles before,” Lavle said. He said “roads are slightly better now” in his region and a gearless two-wheeler is also comparatively “easier to manoeuvre” than a motorcycle. Largely considered an urban phenomenon, scooters are now making deeper inroads into India’s hinterlands with developing road network, growing number of female customers and as their fuel-efficiency improves to match those of entry-level motorcycles. Bountiful monsoon rains for the third consecutive year and rise in farmers incomes is also helping boost demand. “Over the years, with changing customer preferences and consumption patterns, scooters are picking up pace of penetration in rural and semi-urban areas,” Y. S. Guleria, senior vice president of sales and marketing at Honda Motorcycle and Scooter India Pvt. Ltd told Mint in emailed response to queries. 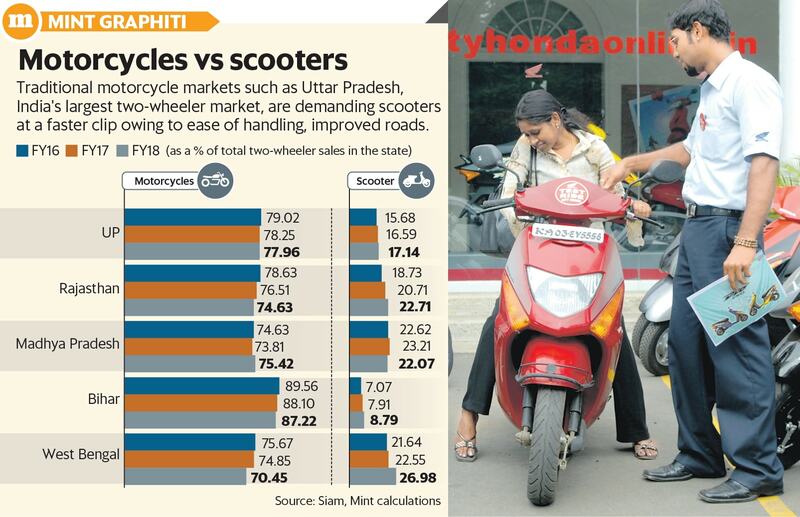 Though Maharashtra has a high penetration of scooters at 40% of total two-wheeler sales, traditional motorcycle markets such as Uttar Pradesh, West Bengal, Rajasthan, Madhya Pradesh and Bihar, which rank amongst India’s top 10 two-wheeler markets, have witnessed scooter sales outpace motorcycles in the past two financial years. The share of scooters in these states has crossed 20%, except in Uttar Pradesh and Bihar where too scooters are gaining traction. The sales growth is albeit off a low base, according to data compiled by the Society of Indian Automobile Manufacturers (Siam). Of the five states, the share of scooters grew the most in West Bengal to 26.98% in FY18 from 21.6% in FY16. Rajasthan followed, with a share of 22.7% last year, up from 18.7% in FY16. Bihar and Uttar Pradesh also reported an over 100-basis-point rise. One basis point is 0.01%. To be sure, the shift in consumer choices could be driven by greater urbanization where the underlying factors are more conducive for buying scooters, according to analysts. However, analysts as well as scooter makers believe that factors such as a rise in rural incomes and the government’s focus on the rural sector is driving demand and will continue to do so, at least in the near future. Guleria at Honda said rural demand for two-wheelers has rebounded. Honda, which makes half the scooters sold in India, has been expanding its rural presence adding 70-80% of new touchpoints and dealerships in rural and semi-urban areas, Guleria said. “The scooter potential in these areas remains latently untapped,” he said, adding factors such as the onset of a good monsoon, rural development, a higher minimum support price will support rural incomes, driving sales this year too. Competition is meanwhile intensifying for Honda in rural areas as new models from Hero MotoCorp Ltd, TVS Motor Co. Ltd and Suzuki Motorcycle India Pvt. Ltd are starting to gain acceptance. None of the three companies responded to queries from Mint. Aggressive pricing by Bajaj Auto Ltd on entry-level motorcycles may also shift some of the scooter demand. 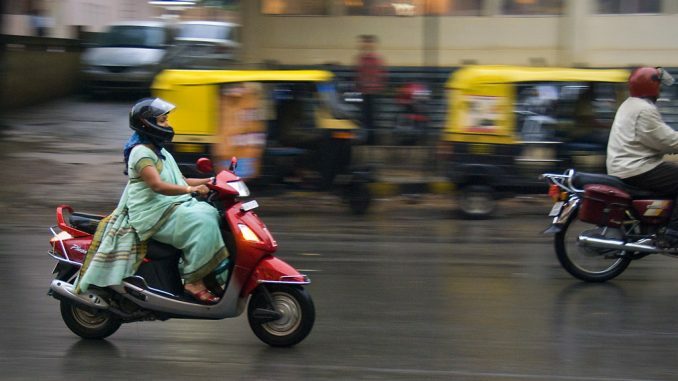 “Since entry-level motorcycles have been traditionally preferred by customers in rural and semi-urban areas, aggressive pricing by some OEMs may dampen rural demand for scooters as price is a significant factor in decision-making in these markets,” said Anupama Arora, vice president and head corporate ratings at Icra Ltd. The price factor may have already started to impact as motorcycle sales outpaced those of scooters during February to July, primarily led by entry-level motorcycles. Bajaj began cutting prices since the beginning of 2018.